BY the time you read this, England would have won the 1966 World Cup all over again and football fans will be convincing themselves that lifting the Jules Rimet Trophy is merely the start of a golden era of English superiority. Of course, we all know different. I remember, as a young lad, going to Wembley in 1968 and 1969 to see “Sir Alf Ramsey’s World Champions” as they were called. I saw some lack-lustre displays by England against Romania and Bulgaria, but looking back, I can say I saw the bulk of 1966’s heroes perform. And yesterday, I saw them again as I was present in trendy Shoreditch in east London as the entire match was played out on screen. It’s well known that many of that team failed to make an impact in football management, adding fuel to the argument that great players do not necessarily make successful managers. Very few seem to make the transition. I met Alan Ball some years ago and he was quite bitter that the Football Association and indeed, football generally, failed to leverage the skills and knowledge of the only England side to win the World Cup. Actually, the stock of the Boys of ’66 has risen dramatically in recent years as we all realise they performed a feat that now seems as unlikely as Sam Allardyce becoming England manager (!). A lack of opportunity at the highest level led some of the 1966 squad to seek solace in non-league football. How strange it must have been to see the likes of Hurst, Moore and Peters turning up at this level after the lofty heights of their achievement. Oxford City, when I last went there, had a photo of England skipper Bobby Moore in their boardroom in memory of his time at the club. “Mooro” took his old team-mate Harry Redknapp with him to Oxford, but it was only a short stint in the Isthmian League for the former Hammers’ duo. I came across Moore at his pub in Stratford in the mid-1970s – he was dressed impeccably and surrounded by heavy-jowled men in black. There was something of an aura about the great man and it seemed a bit unreal that England’s World Cup winning skipper was standing just across the bar from you. 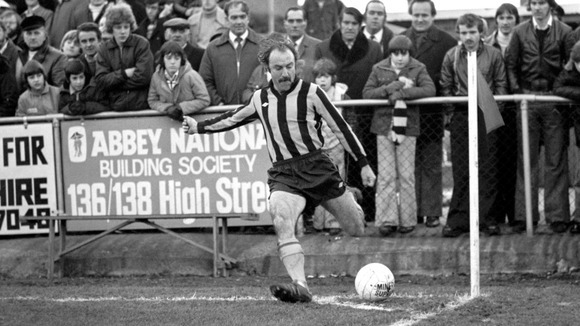 Jimmy Greaves, England’s ace striker that didn’t play in the final, quickly drifted into non-league after finishing his playing career with West Ham. He ended-up plying his goalscoring trade at Brentwood, Chelmsford City, Barnet and Woodford Town. Despite battling alcoholism, Greaves played on into his late 30s – and he never lost that goal poacher’s instinct! Geoff Hurst, often blamed for Greaves’ absence in the final, went into management with Telford United and was prominently featured in Brian James’ excellent book, Tividale to Wembley, chronicling the 1976-77 FA Cup. Hurst spoke of the very different world of non-league in that book, but you sensed he was aiming for bigger things than Telford United and when Ron Greenwood became England manager, Hurst joined the coaching staff of the national team. He then briefly managed Chelsea. Telford were also managed for a short while by Gordon Banks, but he was sacked and subsequently offered a job as a raffle ticket seller at the club! Events at Telford proved to be too much for arguably England’s greatest ever goalkeeper. “It broke my heart…I did not want to stay in the game,” he has said. Other players from the England squad of 1966 had flirtations with the non-league game: George Cohen briefly managed Tonbridge, Peter Bonetti appeared in goal for Woking, Martin Peters lined up in defence for Gorleston, Terry Paine played and managed Cheltenham and Ron Flowers played for Wellington. On the other end of the career, John Connelly started out in non-league with St. Helens Town in the Lancashire Combination. It must have been hard for the men who lined up on that glorious July afternoon in 1966. Once they had won the World Cup – what could they do next? After all, it’s a little like the footballing equivalent of landing on the moon? What do you do with a man who has reached the pinnacle of his career by the age of 27 or 28? Look up your local non-league club, perhaps? Next Entry World Cup 1966: Is this our final celebration?